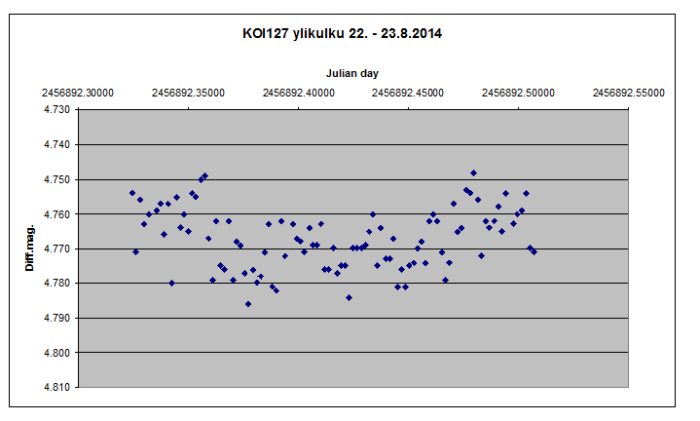 Posted August 23rd, 2014 by Jari Juutilainen & filed under Extrasolar Planets, Observations. The autumn season has started with usual rainy weathers but Taurus Hill Observatory’s research team member Veli-Pekka Hentunen managed to measure the light curve of exoplanet KOI127b. KOI127b is one of the exoplanet candidates found by the Kepler-satellite. For the light curve 102 images with 150 seconds exposure time were taken. The star wich expolanet KOI127b is orbiting is very dim, having brightness of only 13,9 magnitudes. The night sky still isn’t really dark here in Finland which makes some inaccuracy to the light curve measurements. According the measurements transit of the Expolanet KOI127b lasted for 176 minutes and the alteration to the brightness of the star was 11,4 mmag. This is the first observation of KOI127b in the TRESCA database.